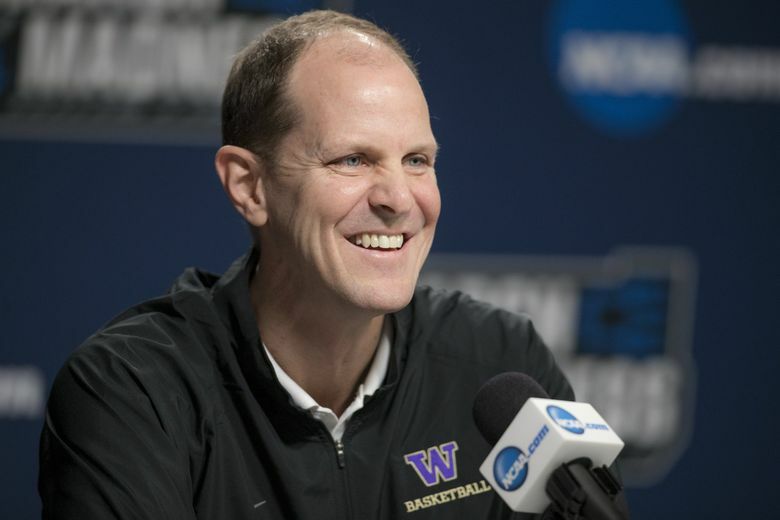 COLUMBUS, Ohio — On the eve of their first NCAA tournament in eight years, the Huskies rewarded Mike Hopkins with a six-year, $17.5 million contract that will keep him at Washington through the 2024-25 season. The deal represents a significant commitment between UW and its second-year coach. “I’ve always believed in surrounding yourself with great people, and I have at the University of Washington,” Hopkins said Thursday at an NCAA tournament news conference before UW’s practice at Nationwide Arena. “I’m excited to be there for a long time. Hopkins was hardly in the mood to discuss his new contract before leading No. 9 seed Washington (26-8) against No. 8 Utah State (28-6) on Friday in a first-round NCAA tournament game. The timing of the announcement is somewhat odd considering Hopkins appeared uneasy that his new contract briefly usurped attention away from the Huskies ahead of the biggest game of his life. Still, the Huskies can breathe easy — for now — after securing their coach who had been rumored to be in contention for job openings in the past. Hopkins will be paid $2.5 million next season. He’ll earn annual raises that increases his base salary to $2.8 million in year two, $2.9 million in year three, $3 million in year four, $3.1 million in year five and $3.2 million in year six. If Hopkins leaves Washington before March 21, 2021, he owes the Huskies $6 million. The fee decreases to $3 million if he leaves before March 21, 2023 and it goes down to $1 million if he bolts before March 21, 2024. The terms of Hopkins’ remittance to the Huskies would decrease by 50 percent if UW athletic director Jen Cohen is no longer at the school. Last week, Cohen said the Huskies were nearing a deal with Hopkins. Last year, UW gave Hopkins a one-year extension to his original six-year, $12.3 million deal that paid him $1.9 million this season. Hopkins’ new contract puts him on par with many of the top-paid coaches in the Pac-12. Hopkins’ 2019-20 salary of 2.5 million is expected to fall well behind Utah’s Larry Krystkowiak who made $3.6 million this season. Oregon’s Dana Altman and Arizona’s Sean Miller also earned $2.8 and $2.7 million respectively this season followed by Arizona State’s Bobby Hurley ($2.4M). Cohen said it made sense to secure Hopkins to a long-term after he took over a team that finished 9-22 overall and 2-16 in the Pac-12 in 2017 and guided Washington to a 47-21 record the past two seasons. Last season, the Huskies advanced to the second round of the NIT after compiling a 21-13 record, including a 10-8 conference finish. This season, Washington is 26-8 and easily won the Pac-12 regular-season championship with a 15-3 record. It was UW’s sixth regular-season conference title since 1953. Last week, the Huskies advanced to the Pac-12 Tournament finals before falling 68-48 to Oregon. Hopkins joins Tippy Dye (1950-52) as the only UW coaches to win at least 20 games in their first two years. Hopkins has received $80,000 in bonuses this season, including $40,000 for UW winning the Pac-12 regular-season title, $25,000 for guiding UW to the NCAA tournament and $15,000 after being named the conference’s coach of the year for the second straight year. UW's 2-3 zone has stifled opponents all season. Will it work in the Big Dance?